Very few golfers know the Rules as well as they would like. My aim is to assist players to assimilate them gradually by presenting interesting information relating to a variety of Rules situations. 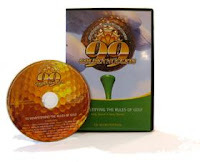 Here are 9 quick tips taken from my CD ’99 Golden Nuggets to Demystify the Rules of Golf’ produced by GolfSwingSecretsRevealed.com**, each of which could save you several strokes over the course of a year. 1. Put personal identification marks on all your golf balls. • I reckon that this tip saves me at least ten strokes a year, by materially reducing the risk of playing a wrong ball. And there is the added bonus that sometimes friends find my lost balls and return them to me! 2. Read the Local Rules before commencing your round. • Never start a round of golf on a new course without checking their Local Rules. You need to know such information as whether any immovable obstructions are designated integral to the course, whether you can take relief from staked trees, whether taking relief from GUR is mandatory and whether you can remove stones from bunkers. 3. Hover your club above the ground in windy conditions. • Avoid the risk of incurring a penalty if the wind moves your ball after you have addressed it (i.e. taken your stance and grounded your club) by not touching the ground with your club before making your stroke. 4. Work out the Nearest Point of Relief before lifting your ball. • There will be times when it is better to play your ball as it lies (if permitted by the Rules) rather than taking relief that means you have to drop your ball in a less favourable position. 5. Get opinions from fellow competitors on points of information. • Under the Rules, distances, position of hazards, line of play (except on the putting green) and where the flagstick is located are public information and not advice. 6. Think before you drop a ball under the Rules. • If there are loose impediments in the area that you are going to drop the ball you are permitted to remove them. It is wise to do so rather than have your ball come to rest against a stone or a twig. Also, try and drop the ball somewhere where its roll might be to your advantage. For example, it is easier to play a ball that has rolled down a slope to a smooth lie than play it off the face of a slope. 7. Deem your ball unplayable if you really don’t fancy your next stroke. • A player may deem his ball unplayable at any place on the course, except when the ball is in a water hazard. So, you may always take a penalty stroke and choose one of the three options under Rule 28 - Ball Unplayable. 8. Develop a routine to use when you are asked to mark your ball to the side on the putting green. • What I do before marking my ball to the side at the request of a fellow competitor is to turn my putter round and hold it by the head rather than the grip. This triggers me to remember to replace my ball where it was, thus avoiding the general penalty for playing from the wrong place. • If you are not sure about a Rule ask your fellow competitors because information on the Rules is not advice.